Postponed for a year by the Events of September 11, the New York City-based Comedy is being produced by IndependentActor Productions. 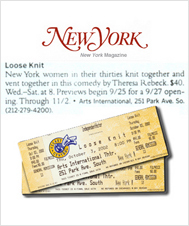 August 12, 2002 – NEW YORK, NY – Adultery, sibling rivalry, job loss and loneliness are only a few of the issues unnerving five New York women in their 30s as they come together for their weekly knitting group in Theresa Rebeck’s “slice of life” comedy, Loose Knit. Originally planned to open in 2001, the devastating events of September 11 prevented IndependentActor Productions from launching this off-Broadway production. A year later, this provocative play is set to open October 4 in the theater space at the highly acclaimed Arts International at 251 Park Avenue South at 20th Street in New York City. Loose Knit will run through November 2. At the helm of this production is Cynthia White, the Artistic Director of IndependentActor Productions, who will not only direct Loose Knit, but will also play its plucky “Margie” character. White most recently appeared in the independent film, City.com and starred in Material Girls, Spiritual Women at the 78th Street Theater. In addition to Loose Knit, award-winning playwright Theresa Rebeck is widely known for such plays as Dollhouse, The Family of Mann and Spike Heels. Her illustrious television writing credits include episodes of NYPD Blue, Brooklyn Bridge, Homicide, and L.A Law, just to name a few. Loose Knit was originally produced by Second Stage Theatre in New York City in 1993; additional productions of the popular play have run at New York Stage and Film, The Source Theatre of Washington and the Longwharf Theatre in New Haven, CT. Loose Knit previews September 25th-28th, opens October 4, and runs though November 2. Show times are Wednesday though Saturday at 8:00 pm. Tickets for Loose Knit are $35 and can be purchased in advance at www.ticketcentral.com or at the door. Brooklyn, NY - West Elm, Williams-Sonoma's five-month-old catalog aimed at young, mid-market urban sensibilities of the East Coast variety, is staking its Gotham bona fides in a uniquely plugged-in way. The book has partnered with IndependentActor Productions to sponsor a limited engagement production in New York of stage and television writer Theresa Rebeck's "Loose Knit," a slice of life comedy about — what else? — a group of young New York women. Rebeck's screen credits include scripts for "Law & Order," "NYPD Blue" and "Third Watch." August 12, 2002 - NEW YORK, NY - Adultery, sibling rivalry, job loss and loneliness are only a few of the issues unnerving five New York women in their 30s as they come together for their weekly knitting group in Theresa Rebeck’s “slice of life” comedy, Loose Knit. Originally planned to open in 2001, the devastating events of September 11 prevented IndependentActor Productions from launching this off-Broadway production. A year later, this provocative play is set to open October 4 in the theater space at the highly acclaimed Arts International at 251 Park Avenue South at 20th Street in New York City. Loose Knit will run through November 2. Four-color postcards promoting the play — and West Elm's sponsorship — began hitting the mailboxes of New York-area West Elm subscribers this week. Next on the agenda for West Elm: the launch of online shopping in 2003 and store openings in 2004. Steadfast, resilient and undaunted. These are just a few of the qualities embodied by Cynthia White, whose passionate resolve sometimes clashes with insurmountable odds. As the director and star of the off-Broadway revival of Theresa Rebeck’s provocative “Loose Knit,” White persevered to overcome many obstacles and much adversity caused by the events of September 11 in order to present this play. Damages from the terrorists’ bombing and the clean-up process displaced the New York City resident from her Tribeca home which is just a block from the World Trade Center. Three weeks following the attack, investors who had signed on to underwrite “Loose Knit” reneged on their pre-9/11 commitments. These obstacles only proved to increase White’s determination and fuel her passion for bringing forth “Loose Knit” which is set to open September 25th in the innovative theater space at Arts International on Park Avenue. White’s previous directing credits include “Independence” at Pulse Theater, “Angevin by Four” at the 78th Street Theater, and “The Rivals and Skirmishes” at Theosophical Society. As an actor, she has been directed by such luminaries as Laurence Olivier, Peter Jackson and Derek Jacobi. White will portray “Margie” in “Loose Knit,” a character she says she identifies with strongly because of her tenacity. A seasoned veteran of many national tours and New York productions, White most recently was seen in the independent film, “City.com” and starred in the one-woman show, “Material Girls, Spiritual Women,” at the 78th Street Theater. Her impressive repertoire also includes extensive work in Great Britain and Ireland where she was an apprentice with the venerable Royal Shakespeare Company and a member of the distinguished Joan White English Theatre Company at the Abbey and Gate Theatres. A native of Ridgefield, Connecticut, White was graduated from New York University’s Tisch School of the Arts with a B.F.A. in Drama. She studied for eight years at the renowned Lee Strasberg Theatre Institute in New York and London and was a master student of Anna Strasberg for four years. She studied dramatic literature at the University of Trinity in Dublin and has performed with Joan Plowright. While touring with Shakespeare’s “Cymbeline” in Russia, she also taught sensory workshops at the Moscow Art Theatre. White is also the originator of the “IndependentActor” program for professional actors. She designed her unusual business consultancy to teach actors how to audition more effectively and to take charge of their careers in an effort to land the types of work and roles that they desire most. She has achieved a 70 percent success rate in helping her students obtain their targeted work goals and roles. White’s diverse background also includes working as a producer for MTV Networks and national tours for such major corporations as Nintendo, Pepsi and Reebok, where she gained invaluable experience and insight into the business side of the entertainment industry. Her distinct voice can be heard on an array of national television commercials, networks and voice-overs including Soap Center, L’Oréal, USA Networks and Lifetime Television. A member of AEA, SAG and the Writer’s Guild, White shares her Manhattan home with her two beloved West Highland white terriers. This inspirational quote by the Greek philosopher seems to best describe the plucky attitude of actor and artistic director Cynthia White as she persevered to resurrect her company’s production of Loose Knit, the comedy by playwright Theresa Rebeck, which was quashed last September by the tragic events of September 11. Prior to September 11, White’s company, IndependentActor Productions, was preparing for its inaugural season in New York City with three productions -- the opening of Loose Knit was slated for the kick-off in Fall of 2001, followed by an original work co-written with Alice Moss called ‘Mamasita,’. White, who resides in a studio apartment in the Financial District, just one block from the World Trade Center, was displaced from her home for months by the damages from the terrorists’ bombing, the security restrictions and the lengthy clean-up process. In addition, she had to cancel the IndependentActor classes she teaches from her home for five months and refund the students’ tuition. Within three weeks following the attacks on September 11, plans for IndependentActor Productions’ inaugural season unraveled when the major underwriters for Loose Knit cancelled their sponsorship agreements amidst all the confusion and uncertainty in New York City. Suddenly, White’s production, which had been in the making for two years, came to a crashing halt. She had worked hard to secure the rights to Loose Knit and to manage all of the elements required to assemble such a project -- from finding funding and theater space to casting and meeting with various designers. Initially, White sought financial assistance from some of the agencies that provide assistance in times of disaster including Safe Horizons, Federal Emergency and Management Agency (FEMA), the American Red Cross, and Small Business Administration, to name a few. Her efforts to seek financial assistance during her time of need only added insult to injury. Most of these relief organizations told her that they could not assist her as they did not consider actors, directors or the theater as viable professions. White said she felt as if she had been crushed a second time by this callous attitude toward her profession. Most people advised her to pack up and move, the US government even offered her money if she would relocate and start another business elsewhere. Despite facing many challenges and obstacles, White was undaunted and steadfast in her plans to remain in New York. She said she fought “tooth and nail” to get back into her apartment, to stay there, and to eventually re-launch her acting classes and production company. As testimony to the “Take Charge of Your Career” a tag line White coined to underscore the message of her IndependentActor courses, she was not content to sit on the sidelines waiting for the theater to recover, but instead has taken an active role in being part of the recovery effort itself. White wrote to the New York Foundation for the Arts and explained the challenges she had been facing with her uphill battle to remain in New York. The New York Foundation for the Arts cited her artistic achievement and recognized her with the award of a generous recovery grant that has enabled her to rebuild her production company and start anew. In an effort to fund theater projects she felt had true artistic merit, White teamed up with advertising professional Kathryn Rolston and together they pioneered an innovative “strategic theatrical marketing”ä approach to attract major sponsors to underwrite their productions. They develop synergistic partnerships between the production with corporations seeking marketing and branding opportunities as well as individual investors who support the arts. These collaborative partnerships allow corporations to target a specific demographic and raise brand awareness for their products, and the artistic integrity of the play remains intact while its unique aspects are maximized as marketing opportunities to secure sponsorships. When Loose Knit opens this fall in the theater space at the acclaimed Arts International in New York City, it will be the realization of the dream from which White could not be swayed - one that she has brought to fruition one stitch at a time.